It is said that tomorrow, May 21, 2011 is Judgment Day. Billboards around America have declared that the end is near and that Christ will return. Over the course of the subsequent five months the earth will be destroyed. In the history of American religion this is not a new tale or theology. It has been here before, even for the contemporary prognosticator (who once before predicted the end to happen in September 1994). A farmer, Miller was also a lay leader in the Baptist church in New York, near what was known as the “burned-over” district that produced other religious movements like Mormonism. Miller began publicly announcing his views in the early 1830s. 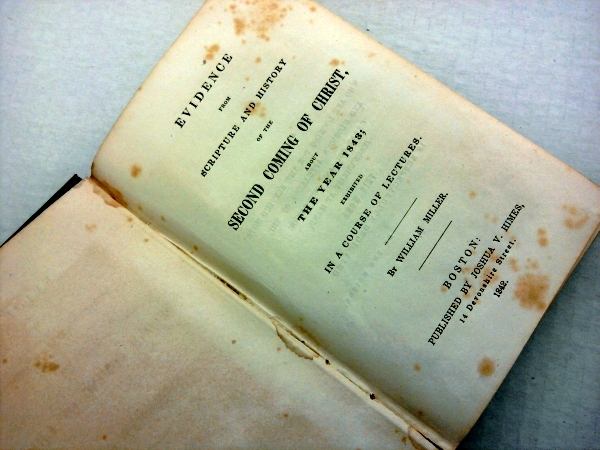 He published “Evidence from Scripture and history of the second coming of Christ about the year 1843 : exhibited in a course of lectures” and by the early 1840s it began to gain national attention as others took hold of his ideas and publicized them. One such figure was Joshua Vaughan Himes, pastor of Chardon Street Chapel in Boston, who published a newspaper, Signs of the Times. “Millerite” papers began to spring up around the country in cities like New York, Philadelphia and Cleveland. In the early months of 1843 over a half million publications had been printed and distributed. Miller’s day passed with great disappointment. It is quite likely that on May 22, 2011 the sun will rise as it had the day before reinforcing that no one knows the day or the hour, except the Father.